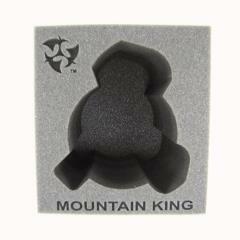 This tray will hold one Mountain King Colossal. This tray comes engraved with the Colossal name and Trollbloods logo. 7 inch (178 mm) thick tray. This tray was designed to fill one side of a Privateer Press Bag. With this tray size, you can stack foam trays side by side in the bag.